STORM® Equus is a unique scientifically proven feed supplement that features ProCarnosine® to aid training and performance during intense exercise, and to deliver sustained speed and power. Racing Blue is a family owned business originally started in Newmarket, England, that now distributes all over the world and throughout the United States. Much of the scientific research that backs the Racing Blue STORM range was undertaken by our own equine scientists and nutritionists. As a company, we strive to bring innovative products to the market place that are backed by scientific research and contain suitable levels of active ingredients to ensure that each product makes a difference to health, performance and well-being. About STORM®— Designed by Nature— IMPROVED by SCIENCE! Every great Barrel Horse has a story and an owner who works alongside them to help them reach their true potential. STORM® Equus can be your partner, working to support your horse to reach optimal performance with it's unique formulation helping to maintain power to your horse's “engine” when speed is on the line! There is nothing on the market today that can match the effectiveness and deliver the carefully formulated ingredients at just the right level, specifically for horses who rely on speed and endurance for their performance. STORM works with nature, taking advantage of and boosting the level of a type of buffer naturally found in your horse's muscle , which is crucial to fight muscle fatigue. STORM delivers the necessary nutritional building blocks to boost these muscle buffers in a form which works with your horses digestive system and normal diet. How Does STORM® Equus Work? * STORM® Equus is a unique scientifically proven feed supplement that features ProCarnosine® to aid training and performance, by targeting muscle acidosis, calcium sensitivity and oxidative stress in muscle during intense exercise to deliver sustained speed and power. * STORM® delays ‘the burn’ of muscle fatigue by improving the body’s natural ability to manage or ‘buffer’ the H+ released from accumulating lactic acid and from other energy-generating biochemical pathways in muscle. Horses are therefore able to maintain their peak speed or power for longer, or in the case of a more aerobic discipline such as endurance to perform at a higher intensity before H+ starts to accumulate significantly. Improved management of muscle acidosis during exercise also means that training can be more effective and muscles will recover more quickly from hard work, racing or competition . * STORM® provides key building blocks to support the synthesis of carnosine, the most important ‘buffer’ in muscle, which is crucial for better handling of H+ during exercise. Carnosine can be thought of as being like a biological sponge that is able to bind with H+ and therefore delay muscle acidosis during exercise. Over a period of 1 month, these ingredients can boost muscle carnosine typically by up to 20% or more. So, Why Choose STORM® Equus Over The Competition? RESULTS! We have no competitors! The STORM range of products is formulated for efficacy and not price and is backed by robust science in horses, humans and other animals. 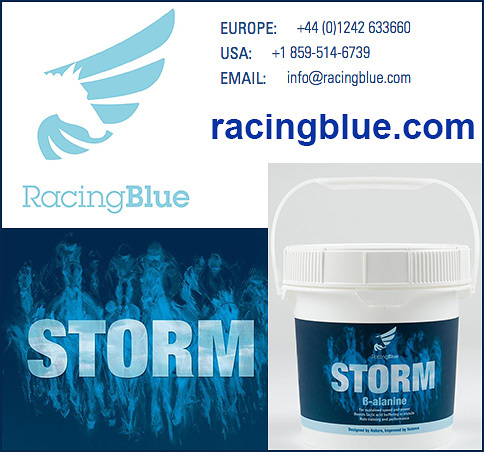 Additionally, the STORM® Equus formulation is unique and proprietary to Racing Blue and is proven in the market place all over the world in many horse sports. Our sports scientists are experts in the field of muscle metabolism and are best placed to provide products that works and will benefit your horse. STORM Equus is manufactured in an accredited mill and every batch of raw materials and finished product is analysed by our sister company Independent Equine Nutrition for a comprehensive range of prohibited substances prior to release for sale. So How Do I Know If My Horse Can Benefit From STORM? If you barrel race purely for fun and don’t care about winning or helping your horse to be all he or she can be— you certainly don’t need STORM! STORM is for riders who want to give their horses the winning edge against the competition— STORM is for people, and horses, that take barrel racing seriously and want something more than just a day out in the sun with friends. So How Will I Know That STORM is Working? You’ll feel and see the difference! Whilst it’s difficult to see the enhanced biochemistry going on in the muscle in response to feeding STORM, you can be sure it is of benefit when you start to notice that your horse tires more slowly, or is able to sustain a higher intensity of training or competition and bounce back from exercise more quickly. How Do I Feed STORM® Equus and When Do I Need To Start It Before A Race? STORM® Equus , needs to be fed morning and night for about 6-8 weeks before the effects are apparent. So ideally feed before the show or competition season and then it must be continued every day throughout the season to maintain its desired effect. At the end of the competition season you can take STORM out of your horse’s diet until just before the next season starts as before… after all, your horse doesn’t need top speed and performance if he is just taking a winter off in pasture! Can Other Performance Horses Benefit From STORM? * STORM® Equus should be added daily to the normal diet providing part of a normal balanced ration. Note: STORM® Equus is recommended by trainers, vets and nutritionists and is used internationally at the highest level in horseracing. The world class New Zealand Eventing team continues to use STORM® Equus, which they value as part of their horses’ preparation for competition. Doesn’t Your Horse Deserve To Overtake The Competition by STORM? Your competition is using STORM... shouldn't you be? We’re not a cheap supplement—your horse isn’t a cheap horse and the results we give can’t be gotten with any competitor! At $2.79 per day, we can help your horse feel the energy boost, control and endurance that can put him or her in the money. Great horses have great owners who invest in them… STORM, by Racing Blue, is used by top trainers, Barrel Racers and performance people in the horse industry, who recognise the results— and are hoping that you don’t discover them. Call or email us if you have any questions or simply order today on our website— and help your horse to be in the BLUE with STORM® Equus by Racing Blue!